Credit: NASA/PSU/G.Garmire, N.Brandt, et al. 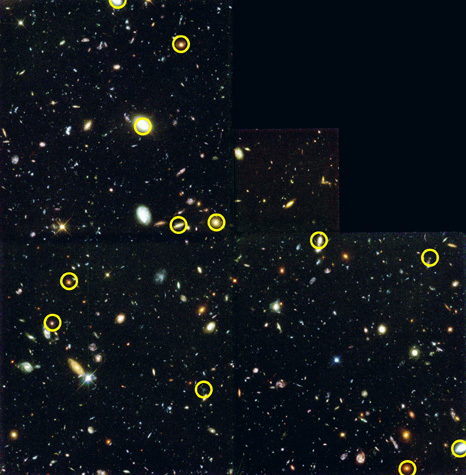 This side-by-side presentation of the Hubble Deep Field-North (left) and the Chandra Deep Field-North (right) clearly demonstrates the importance of looking at the universe in both the optical and X-ray regimes. Twelve X-ray sources are detected in the HDF-N. The false colors represent the "X-ray color" of the objects. Objects that appear more red are cooler in the X-ray band, while objects that appear more blue are hotter in the X-ray band. About half of the sources show strong evidence that the X-rays are due to accretion onto supermassive black holes. The other sources have much lower luminosities, and in several cases are fairly nearby. In these galaxies, the Chandra X-ray detection is most likely the summed emission from a handful (or even one) bright sources within the galaxy, such as stellar-size black holes in binary star systems, the hot gas within the galaxy, or the remnants of supernova explosions. Chandra is thus now peering far enough into the universe to detect the type of X-ray emission that one finds in "normal" galaxies such as the Milky Way. This allows us to look back several billion years to see what our own galaxy and neighborhood (the Local Group) might have been like at earlier times. Credit NASA/PSU/G.Garmire, N.Brandt, et al. Scale Image is 2.5 arcmin across. Coordinates (J2000) RA 12h 36m 45.70s | Dec +62° 13´ 58.00"
Color Code Colors indicate temperature or X-ray hardness, but brighter sources are more intense.